Across the coming 15 months I’m embarking on the comprehensive and deeply satisfying project of indexing all of my notebooks, mind-map sketchbooks, journals etc. from the past twenty years. It’s an inventory of ideas, a tended garden of forking paths, a purposeful search through lost time, a catalogue of trajectories and a (re-)discovery of generative themes. I’ve discussed my plan with fellow system-thinkers and chaos-makers, and the universal consensus is that this project should be documented. Welcome to its beginning. Volumes V Since 1999. 18 volumes. Entries dated. Volumes numbered and dated on inside cover. Sketchbooks S Since 2001. 3 sketchbooks. No consistent references. Some mind-maps dated. Ideas books I Since 1996. 3 books. Contents pages and cross-references. Notebooks N At least twenty years. Unknown number of books. Some dated entries. Professional development books P Since 2009. 1 book. Pages hand-numbered. Work diaries W Since 2005. 1 per year. Dated with notes sections. Work diaries prior to 2005 were hand-made and sadly not all survive. Bauhaus notebook B 2001-2002. 1 book. Pages selected at random for entries. Some entries dated. Needs numbering. 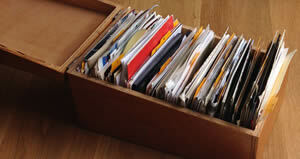 Card file C Fifteen years. 1 file. Alphabetical but movable. Filing cabinet F At least fifteen years. One large 2-drawer lateral unit. Files, folders, tab-marks. Now any entry in any book can be referred to – once each book has its own internally coherent index, which of course need not be consistent across all the books. Earlier, in mentioning when it was that I first created the list above, I used the reference I2/26.03.14 which refers to the entry in the second Ideas book dated 26 March 2014. Similarly, V15/22.12.11 is the entry in Volume 15 dated 22 December 2011 where I describe the feeling of being compelled to write. The next step requires a decision. The distraction-challenge that will occupy my mind between today and my next INDEX-SYSTEM focus will be the decision on what form the index itself should take. Card file or index book? 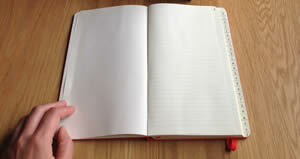 My original idea was to house the index in a red A5 Moleskine, which would exist as a single portable volume. I would make entries and then leave a suitable gap of unknown size for adding further references, as I would go through the delicious process of re-reading past books, identifying themes and entering them into the index. A card-file, on the other hand, allows each index entry to exist as its own card, with plenty of room for cross-references, as well as the possibility to re-catalogue the entry as the system begins to generate its own ideas, its own meaning. The red book is beautifully self-contained, but shouldn’t an index remain open? INDEX-SYSTEM is an unrealised project I developed in the days when I was working both as a designer and a programmer, within a brief period in the late 1990s where neither practice had primacy over the other. I began to think about what a more sophisticated approach to metadata would make possible the systematic exchange of ideas that remained in development. I imagined an editable set of drop-down boxes in an open database where anyone anywhere could create the kind of index entry I describe here, and share that incomplete thought with others. I was long fascinated by the systems kept by world-crafting artists like Stanley Kubrick and Alfred Hitchcock, or world-diagramming philosophers like Hegel and Deleuze. What if those unrealised ideas could take shape in unintended ways? A very welcome unintended consequence of planning this new iteration of INDEX-SYSTEM has been the desire to document and share my unrealised projects. I’ve just created two new categories for this blog: INDEX-SYSTEM and UNREALISED. I will be delighted to see the shape they’ll each be in come year’s end and beyond. This entry was posted in INDEX-SYSTEM. Bookmark the permalink.